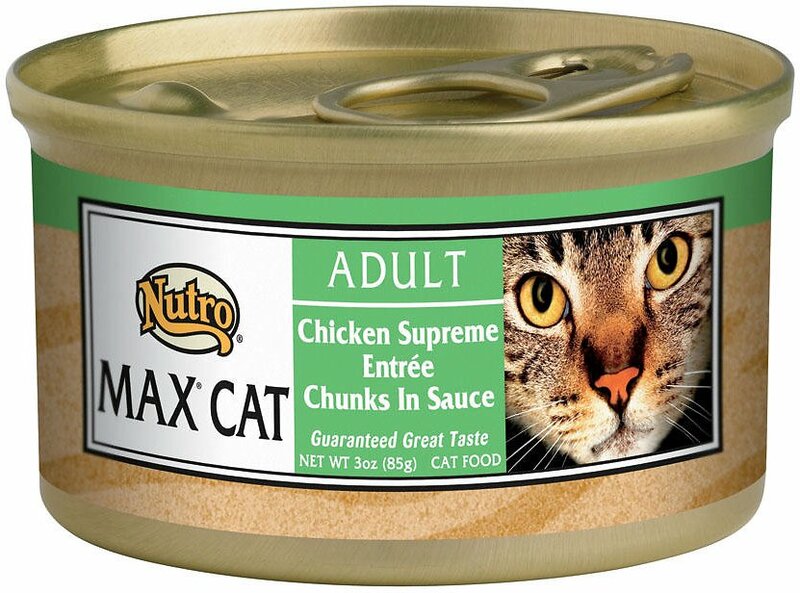 Your kitty loves real meat, so give him the nutrition he craves with the Nutro Max Adult Chicken Supreme Entree Chunks in Sauce Canned Cat Food. Featuring real chicken with never any by-products, it provides plenty of quality protein for healthy muscles and the flavor your little carnivore loves. Slow-cooked in savory sauce, every bite is also packed with all the nutrients your pal needs to look and feel his best, like vitamins, minerals and essential taurine, plus omegas for a healthy skin and coat. It also provides plenty of moisture to help keep him hydrated and healthy from nose to tail! Adult wet food recipe features real chicken in sauce for the protein needed to support healthy, lean muscles. 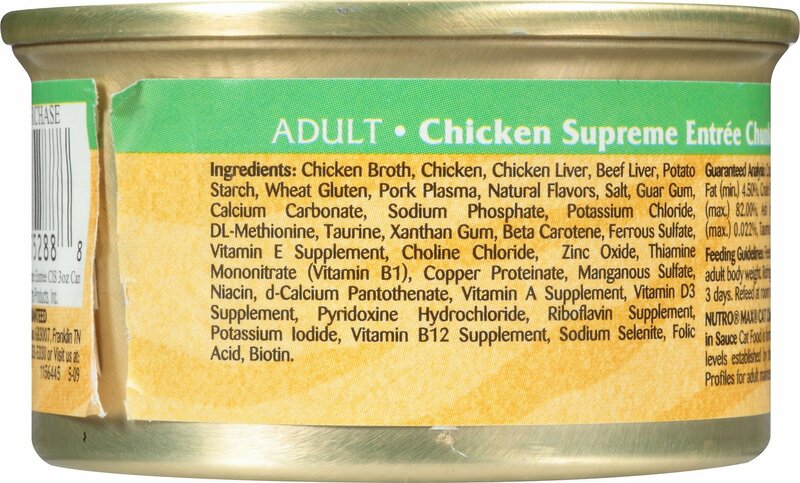 Chicken Broth, Chicken, Chicken Liver, Beef Liver, Potato Starch, Wheat Gluten, Pork Plasma, Natural Flavors, Salt, Guar Gum, Calcium Carbonate, Sodium Phosphate, Potassium Chloride, Dl-Methionine, Taurine, Xanthan Gum, Beta Carotene, Ferrous Sulfate, Vitamin E Supplement, Choline Chloride, Zinc Oxide, Thiamine Mononitrate (Vitamin B1), Copper Proteinate, Manganous Sulfate, Niacin, D-Calcium Pantothenate, Vitamin A Supplement, Vitamin D3 Supplement, Pyridoxine Hydrochloride, Riboflavin Supplement, Potassium Iodide, Vitamin B12 Supplement, Sodium Selenite, Folic Acid, Biotin. She tried it....and LOVED IT!!!! Okay so this arrived by mistake and my first reaction was annoyance because my cat only eats Wellness pate as she is picky and has had many teeth extracted. In the past I have tried to introduce her to other brands with good reviews (who wants to eat the same thing every day for 10 years?). 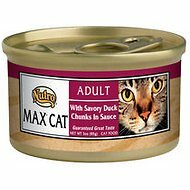 So, I read the nutritional reviews on Max Cat and thought, this sounds healthy ..let's just open it and see before taking it to the shelter...and...ohmigoodness...she turned into a wolverine and devoured it and wanted more! She adores it - absolutely loves it, so now, every Chewy order will include a case of Max Cat! FINALLY SOMETHING ALL MY 4 FURBALLS ENJOY ! FOR A WHOLE YEAR 1/2 NOW I HAVE BEEN TRYING DIFFERENT BRANDS TO FIND THE PERFECT HEALTHY WET FOOD THAT ALL MY 4 BABIES CAN ENJOY. I HAVE ONE FUR BALL SPECIFICALLY WHO HAD ME THE MOST WORRIED AS HE WOULD BARELY EAT ANY OF HIS FOOD WET OR DRY. I WOULD CONSTANTLY HAVE TO HAND FEED HIM PIECES OF CHICKEN TO GET SOMETHING IN HIS SYSTEM. I DECIDED TO GIVE THIS FOOD A TRY & FOR THE 1ST TIME IN 2 YEARS I FINALLY SAW TIMMY LICK A BOWL CLEAN AND I AM ECSTATIC !! ALL 4 CATS LEAVE THEIR BOWL SQUEAKY CLEAN AND IM SURE IF THEY COULD TALK THEY WOULD ASK FOR SECONDS ! ANOTHER BIG PLUS IS THAT THE FOOD IS NOT AS SMELLY AS MOST CAT FOOD. My Babies Are In Love! Usually I don’t write reviews, but this is such a great product. My cats are extremely picky over food. I tried several brands, but this is the one. They love this cat food so much! They will eat every piece in the bowl even the sauce. This is now my cats’ favorite food. I am deciding to buy a different flavor and see if they like it. 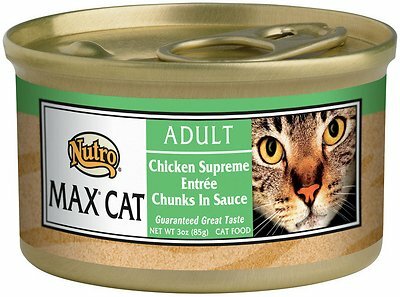 I have just started providing this food to my 3 inside cats. We've gone thru a case of it and they seem to really like it. One of the cats had issues where she was throwing up her canned food. So far, with this food, she is not. The pieces are bigger than I expected, but it doesn't seem to slow them down. 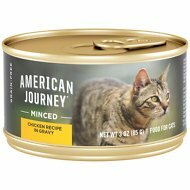 I have been trying different canned foods to get my elderly girl to eat more and keep her weight up. She only weights 8.5 lbs. This brand was highly recommended but was too chunky. I had to mash it with a fork. I will keep trying! 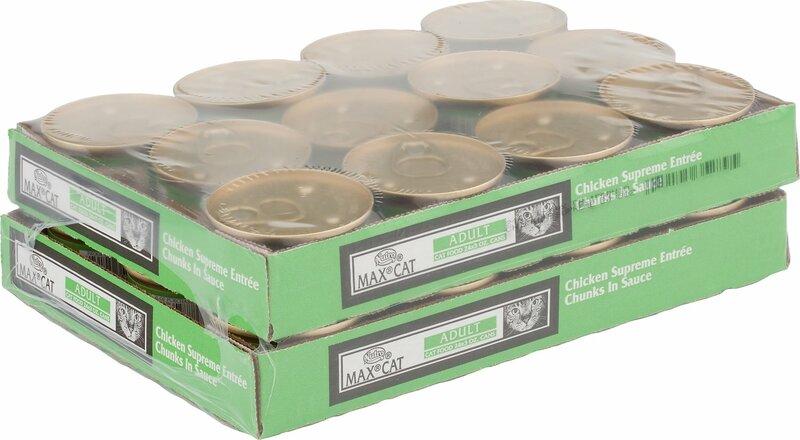 Max Cat canned cat food. I try to feed high quality food but my cats tend to snob most anything I put out. I had not expected for them to devour this canned food but they did. I don’t mind paying for quality as long as the kitties will eat. I’ve placed an order for more of same. I have 2 cats who are complete opposites so trying to find the right food that they both like is difficult. After reading the good reviews about this food and how healthy it is for cats, I decided to try this brand. Both of my cats are happy! They love this food!